Detective Inspector! That’s you! Hurry up, the suspect is on the loose down by Tottenham Court Road. You have to catch him before he strikes again. Gather up the other bobbies and the lorry and get on the case. With this outfit, you’ll fit right in as a chief constable of London’s best crime squad. 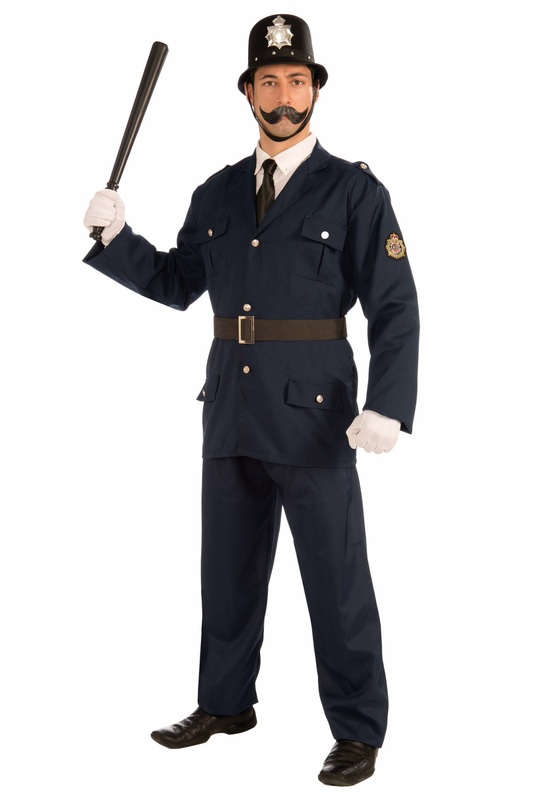 This Keystone Cop Costume will properly suit you up for a fast-paced day of solving crimes, engaging in a battle of wits with London’s worst criminals, and dealing with the politics of the Police Chief who keeps disagreeing with your almost supernatural ability to sniff out a new lead. He’ll say he wants your badge and billy club (remember, no guns for police in England), but you’ll convince him that you know that the elusive financial investor for Lloyd’s of London is the culprit. And in the end, you’ll always prevail, of course you will, you have the sharpest detective mind since Mr. Sherlock Holmes himself. When you put on this authentic looking blue jacket, accompanied with a police badge on the left sleeve and matching blue elastic waist pants, you’ll feel the great responsibility of the law on your shoulders. Place the police bowler style hat on your head and the look will be complete. The only thing you need now is some complex and devious crimes to solve!